For other uses, see Mural (disambiguation). "Muralist" and "muralists" redirect here. For the Mexican art movement, see Mexican muralism. Some wall paintings are painted on large canvases, which are then attached to the wall (e.g., with marouflage). Whether these works can be accurately called "murals" is a subject of some controversy in the art world,[who?] but the technique has been in common use since the late 19th century. 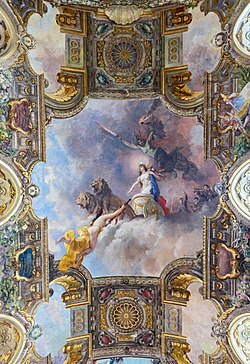 A fresco painting, from the Italian word affresco which derives from the adjective fresco ("fresh"), describes a method in which the paint is applied on plaster on walls or ceilings. Fresco-secco painting is done on dry plaster (secco is "dry" in Italian). The pigments thus require a binding medium, such as egg (tempera), glue or oil to attach the pigment to the wall. In Greco-Roman times, mostly encaustic colors applied in a cold state were used. Tempera painting is one of the oldest known methods in mural painting. In tempera, the pigments are bound in an albuminous medium such as egg yolk or egg white diluted in water. Once completed the mural can be given coats of varnish or protective acrylic glaze to protect the work from UV rays and surface damage. In modern, quick form of muralling, young enthusiasts also use POP clay mixed with glue or bond to give desired models on a canvas board. The canvas is later set aside to let the clay dry. Once dried, the canvas and the shape can be painted with your choice of colors and later coated with varnish. As an alternative to a hand-painted or airbrushed mural, digitally printed murals can also be applied to surfaces. Already existing murals can be photographed and then be reproduced in near-to-original quality. Murals can have a dramatic impact whether consciously or subconsciously on the attitudes of passers by, when they are added to areas where people live and work. It can also be argued that the presence of large, public murals can add aesthetic improvement to the daily lives of residents or that of employees at a corporate venue. The San Bartolo murals of the Maya civilization in Guatemala, are the oldest example of this art in Mesoamerica and are dated at 300 BC. Murals displaying the Marxist view of the press on this East Berlin cafe in 1977 were covered over by commercial advertising after Germany was reunited. In 1961 East Germany began to erect a wall between East and West Berlin, which became famous as the Berlin Wall. While on the East Berlin side painting was not allowed, artists painted on the Western side of the Wall from the 80s until the fall of the Wall in 1989. Many people like to express their individuality by commissioning an artist to paint a mural in their home. This is not an activity exclusively for owners of large houses. A mural artist is only limited by the fee and therefore the time spent on the painting; dictating the level of detail; a simple mural can be added to the smallest of walls. Commissions of murals in schools, hospitals and retirement homes can achieve a pleasing and welcoming atmosphere in these caring institutions. Murals in other public buildings, such as public houses are also common. Panel of glazed tiles by Jorge Colaço (1922) depicting an episode from the battle of Aljubarrota (1385) between the Portuguese and Castilian armies. A piece of public art in Lisbon, Portugal. The azulejo (Portuguese pronunciation: [ɐzuˈleʒu], Spanish pronunciation: [aθuˈlexo]) refers to a typical form of Portuguese or Spanish painted, tin-glazed, ceramic tilework. They have become a typical aspect of Portuguese culture, manifesting without interruption during five centuries, the consecutive trends in art. Azulejos can be found inside and outside churches, palaces, ordinary houses and even railway stations or subway stations. They were not only used as an ornamental art form, but also had a specific functional capacity like temperature control in homes. Many azulejos chronicle major historical and cultural aspects of Portuguese history. ^ Clare A. P. Willsdon (2000). Mural Painting in Britain 1840-1940: Image and Meaning. Oxford University Press. p. 394. ISBN 978-0-19-817515-5. Retrieved 7 May 2012. ^ Only after 664 BC are dates secure. See Egyptian chronology for details. "Chronology". Digital Egypt for Universities, University College London. Retrieved 2008-03-25. ^ "'Pallikalile Chitrabhasangal'" (PDF). Archived from the original (PDF) on 2015-06-20. ^ Jorge Cuní; Pedro Cuní; Brielle Eisen; Rubén Savizki; John Bové. "Characterization of the binding medium used in Roman encaustic paintings on wall and wood". Analytical Methods. Retrieved 1 February 2012. ^ "As used by Eric Cumini Murals". Eric Cumini. Retrieved 18 December 2013. ^ "Toronto Mural Painting". Technical aspects of mural painting. Toronto Muralists. Retrieved 18 December 2013. ^ Sebastián Vargas. "Seizing public space". D+C, development and cooperation. Retrieved 21 December 2015. ^ "Diego Rivera". Olga's Gallery. Retrieved 2007-09-24. ^ Maximilian Rapp and Markus Rhomberg: Seeking a Neutral Identity in Northern Ireland´s Political Wall Paintings. In: Peace review 24(4). ^ Maximilian Rapp and Markus Rhomberg: The importance of Murals during the Troubles: Analyzing the republican use of wall paintings in Northern Ireland. In: Machin, D. (Ed.) Visual Communication Reader. De Gruyter. ^ Commonwealth War Graves Commission. "Last Resting Place". Retrieved 29 May 2006. ^ Bragg, Rick. Somebody Told Me: The Newspaper Stories of Rick Bragg. New York: Vintage Books, 2001. ^ "The Corn Parade". History Matters. George Mason University. Retrieved 27 August 2010. Campbell, Bruce (2003). Mexican Murals in times of Crisis. Tucson: University of Arizona Press. ISBN 0-8165-2239-1. Folgarait, Leonard (1998). Mural Painting and Social Revolution in Mexico, 1920-1940: Art of the New Order. Cambridge: Cambridge University Press. ISBN 0-521-58147-8. Rouse, E. Clive (1996). Mediaeval Wall Paintings. Guildhall: Shire Publications. Woods, Oona (1995). Seeing is Believing? Murals in Derry. Guildhall: Printing Press. ISBN 0-946451-31-1. Latzke, Rainer Maria (1999). Dreamworlds- The making of a room with illusionary painting. Monte Carlo Art Edition. ISBN 978-3-00-027990-4. 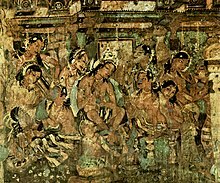 Wikimedia Commons has media related to Murals. mural.ch / muralism.info Universal database on modern moralism, with many details to the works: authors, locations, literature etc. This page was last edited on 5 April 2019, at 20:14 (UTC).